This post is part of a compensated campaign with ProFlowers, a Provide Commerce brand. All opinions are my own. Thanksgiving is approaching quickly, but I’m ready to celebrate and reflect on how blessed we are with friends and family. Our neighborhood is alive and bursting with glorious, vibrant fall foliage! I’ve been taking the long way out of the neighborhood, just so I can slowly drive by all of my neighbors’ firey red, orange, and golden hued trees. 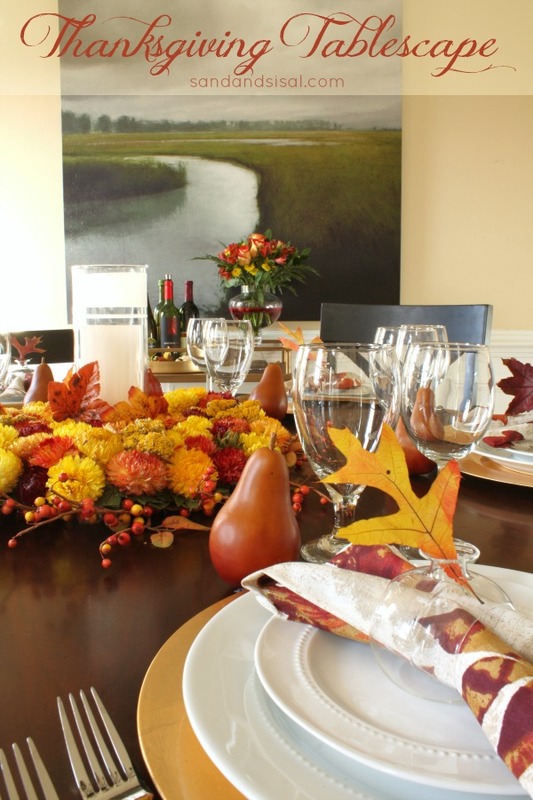 Being inspired by the vivid colors of autumn, I wanted to bring that bright intensity into my dining room for my Thanksgiving Tablescape. Pulling a holiday tablescape together can seem a overwhelming at times, but I made it easy on myself with a bit of help using ProFlowers fall arrangements and I’m absolutely LOVING how it all turned out! We all want to relax and enjoy our holidays right? I set my table with my everyday white dishes from Target, but to spruce them up, I added a metallic gold charger underneath each plate. Years ago, my little sister gave me these mini glass vase napkin rings. They were the perfect vessels for showing off fall foliage finds from the back yard! I sent the kids outside and told them to collect mama some pretty leaves. Looks like they did a great job! You all know me by now, and know that I like thinking outside of the box. I saw this beautiful Dried Flower Fall Wreath and I instantly knew I loved it. Why? 1) It’s dried flowers…. meaning it will last forever essentially! 2) Who says it has to be used as just a wreath on a wall? It can be used multiple ways! So I removed the silk ribbon, placed a faux berry ring I already had on the table and then just laid the wreath on top, placed an etched glass hurricane (diy post to come soon!) and candle in the center and voila! Easy-peasy! My Thanksgiving Centerpiece was done in less than 3 minutes! 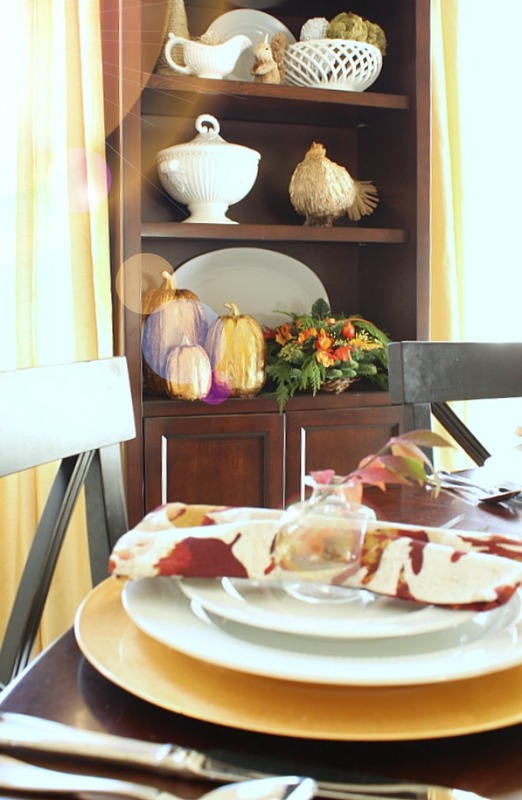 The bookcase turned hutch received the honor of a fresh green harvest Thanksgiving Cornucopia from ProFlowers. Oh my… the wonderful, warm woodsy scent that came out of the box! Luscious! I placed it on the shelf with my copper pumpkins. Ok, I’ll admit, I did splurge a tiny bit this holiday season for myself. Call it an early Christmas present to myself. 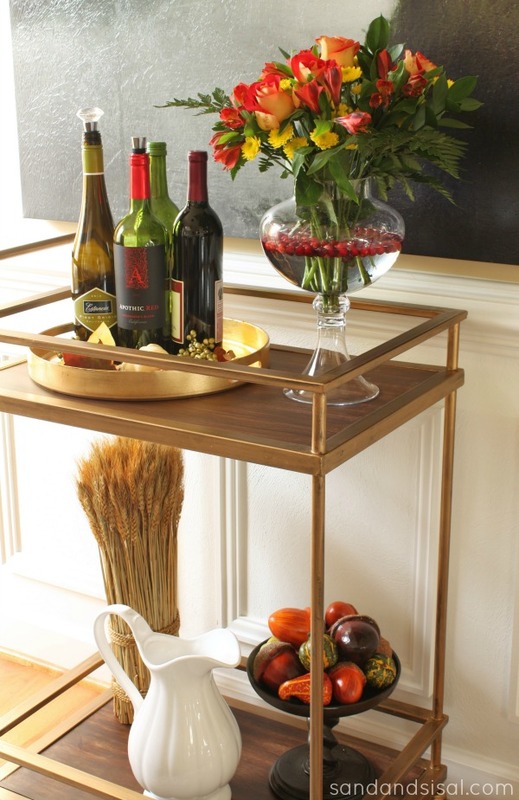 I bought a bronzed bar cart. I have been wanting one of these for 2 years now, and Target had it for an affordable price. I dressed the bar cart with an assortment of wines and another beautiful floral arrangement from ProFlowers. I arranged the flowers in a glass apothecary vase I had and added a sprinkle of fresh cranberries to the water. I absolutely think it’s stunning! Don’t you? When doing your flower arranging, look in your home for unique vessels and use them! Clementine oranges would have also looked stunning in this vessel. Always think, “How can I do this differently?”. If you want to order any of these flowers then click any of these links for a sweet discount! 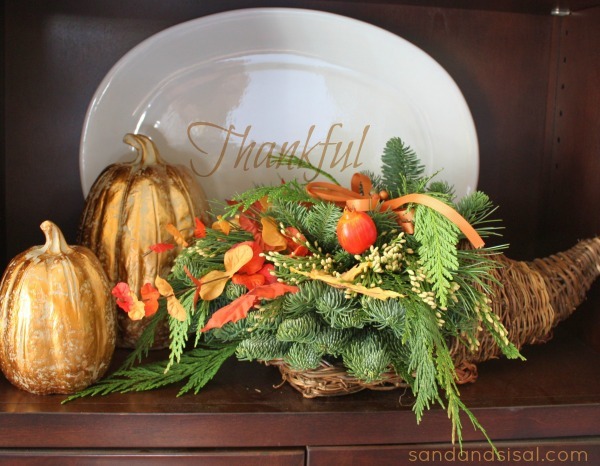 You will love your Harvest bouquet for Thanksgiving! Next to Christmas, Thanksgiving is my favorite holiday. It’s a wonderful time for family and friends to gather, laugh, and enjoy each other’s company. If you want your holiday planning a bit less stressful, then consider using ProFlowers. It certainly helped mine! 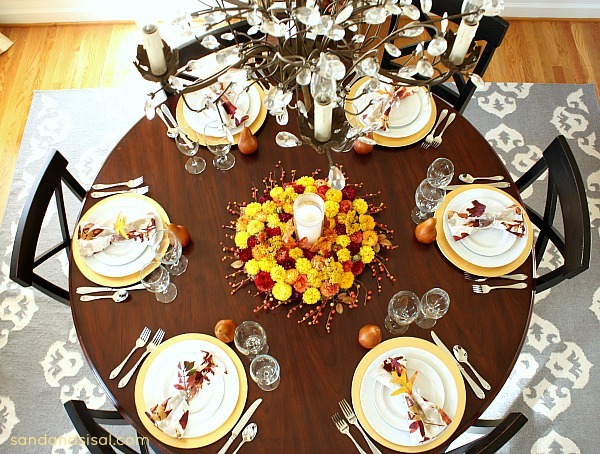 For more holiday tablescape ideas, check out this pin board below. So pretty…there’s nothing like fresh flowers! I love the arrangement with the cranberries floating in the water. Thanks Brandi! I love that cart too! What a beautiful table, Kim! And those flowers are just gorgeous!! So gorgeous Kim!! Those flowers are fabulous! Happy Thanksgiving to you! Thank you Heather! You too! Wow this came out gorgeous! I love how the table looks! Thank you Deanna, I’m really happy with it all! Oh WOW those flowers are gorgeous! I love your centerpiece!!! Pinning and wishing I had it on my table right now!!! Thank you Ashley! I love that I can reuse it over and over again! So gorgeous! And they’re dried?!?! I love that! I know! They have such nice vibrant color for dried flowers. Thanks so much Tara! Everything is absolutely beautiful! I love the fresh flowers in autumn hues and I really love the cranberries! And I need that wreath for my table – actually, we’re in the middle of pretty much redoing the entire house, so I need a table to put the wreath on first, but hey, details. Thanks KC! I really appreciate that! 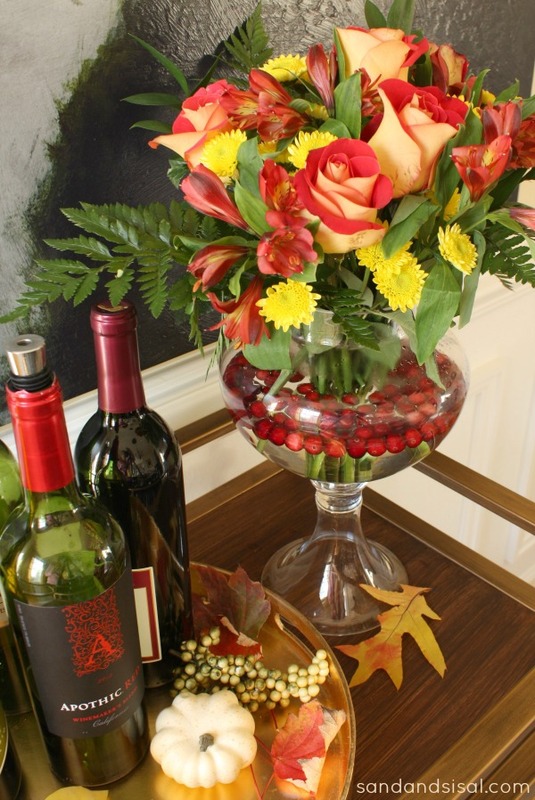 I love all of the flower arrangements – especially the cornucopia and the cranberries in water. So pretty! 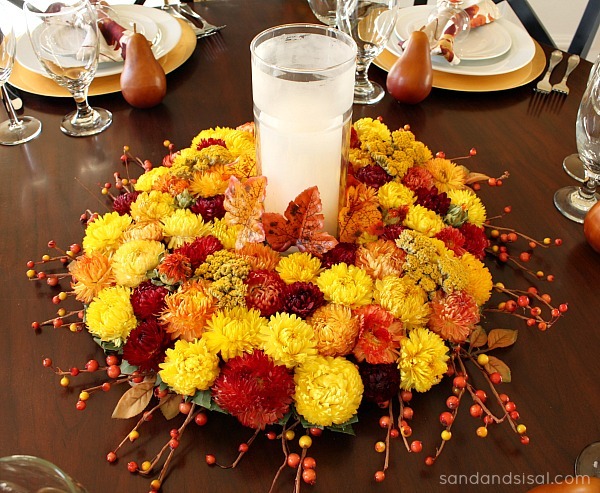 Sooooo clever to use a wreath as part of your centerpiece! Way to think outside the box! Thanks Lauren. I love that I can use it again! Beautiful, Kim!!!!! Love simply elegant!!!! Would love to see a pic of your chandelier…looks like one I have been considering. I am wanting to purchase a new one for my dining room and it seems the more I look….the more I am confused!!! Also replacing my living room light so need something that will compliment and blend with the DR lighting…..any suggestions? Thanks!! Love your blog…always informative and creative!!! 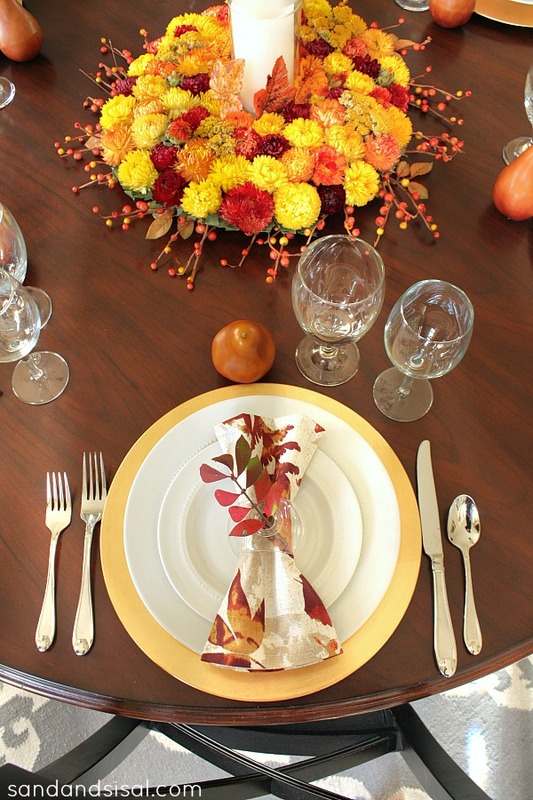 This is gorgeous and inspires me to create a beautiful Thanksgiving tablescape! Thank you Kelly! Have a wonderful Thanksgiving with your family too! I love fresh flowers and should have them in my house more often! 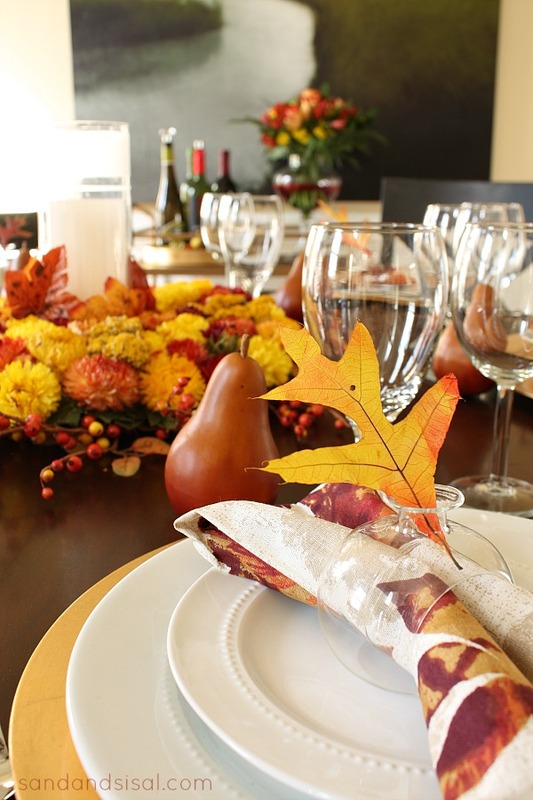 Your table setting is beautiful and the centerpiece sets it off perfectly. Happy Thanksgiving to you and yours.